Jump into a tale of Double Dutch, friendship, and teamwork. Tick-tack-tick-tack-tick-tack—the sound of twin jump ropes spinning up a cyclone makes a joyful noise for three girls on this side street in South Philadelphia. Krystin, Jaleesa, and Amber are practicing to show off their Double-Dutch skills at the upcoming neighborhood block party. They’re aiming for a special prize: to be a “gem,” a special figure of love and leadership within the neighborhood. Double Dutch, though, is way more than a game for the trio of friends, who live together in the foster home of Topaz, or Ms. T. It connects them, binds them, and creates a shared strength to celebrate, handle disappointment, and face any and every challenge. Krystin, the team’s captain, especially faces some tough decisions. With her 18th birthday just days away, her time in Ms. T’s foster home is ticking down. Where will she go? Should she stay in school and shoot for college? Does she have a chance of turning Double Dutch into something more? Choices, self-doubts, and fears weigh heavy on her as she faces a transition from a caring environment to a future of unknowns. Into the mix comes Symone, a pregnant teen from North Philly who brings her own Double-Dutch and stepping talents to the group. Right from the start, she and Krystin clash about who’s the better jumper and being forced to share a room. Yet, as they begin to polish their routine and settle their frictions, they start to see more clearly who they can be—but only if they can work and stick together. It also becomes clear that Symone is not there merely by chance. She carries ties to the neighborhood’s past, a mystery that affects the girls, their sisterhood, and the whole community. Gems are precious or semi-precious stones. How do gems function as metaphors in the play? What are ways gems show up in the play’s dialogue, chants, and other parts of the show? How do each of the girls change during the course of the play? Professor Kyra Gaunt, PhD, is an ethnomusicologist at the University at Albany in New York. In this video interview, she shares some of the history of jump ropes and the unique culture of Double Dutch in urban African American communities. You can also find a Q & A interview with Professor Gaunt in the Adult Guide. Who were the first kids to ever jump a rope for the fun of it? You’d have to take a time machine back thousands of years. Various clues lead to Ancient Egypt and China. From there, it eventually skipped its way to Europe and the Netherlands, and the Dutch are credited with bringing it to North America in the 1600s. One of their jump-rope games evolved into “Double Dutch,” and American kids and teens have been turning twin ropes ever since. Girls in particular took to it, aided by a shift from long dresses to skirts with pantaloons around 1800. Double Dutch really took off in the 1940s and 1950s, especially in northern U.S. cities. For many African American girls and young women there, Double Dutch became much more than a game. Using clotheslines, braided rope, and even super-long phone cords, they took it onto the streets where girls might jump from morning till night. The tick-tack-tick-tack of the ropes laid down a beat not only for jumping but for rhymes and game songs that became part of the tradition. Often turned away from guy-dominated sports, girls doing Double Dutch transformed jump roping into a realm all their own. They introduced moves, etiquette, chants, and traditions that passed from girl to girl and generation to generation. In the 1970s, a couple of New York police officers, Ulysses “Mike the Cop” Williams and David Walker, sought to use this love of Double Dutch as a tactic to keep teen girls off drugs and out of trouble. Walker created the American Double Dutch League (ADDL), and for a while McDonald’s restaurants sponsored local and national Double-Dutch tournaments. The competition could be intense. Teen girls were pushing what was possible between the ropes. They introduced back flips, handstands, and other acrobatic moves that were shared back and forth between them and breaking, the dance style of Hip Hop; and not by accident. Hip Hop and Double Dutch of the 1970s were developing side-by-side in the neighborhoods of New York, Baltimore, Chicago, and other U.S. cities, and the two gladly sampled from each other. Today, Double Dutch has diverged onto two distinct paths. For the more competitive, it is an intense competition featuring uniforms and judges, becoming a sport that has spread worldwide. For others, “street Double Dutch” continues as a neighborhood tradition that binds together girls and women—especially African American girls and women—in a powerful, joyful tradition that brings together rhythm, song, dance, teamwork, and friendship. then think about…an activity or passion you love so much you’re willing to keep going even when it causes pain, even when the going gets tough. The word grit stands for perseverance, drive, and courage. Together with friends, identify people you know—personally or as public figures—who have overcome obstacles and demonstrated grit in pursuit of their goals. What common habits or traits do they seem to possess? Discuss your favorite book or movie with others. Usually, the protagonists face their biggest challenges and most hopeless moments just before they succeed. Why are we attracted to such stories and characters? In parts of Africa, Papua New Guinea, North America, and elsewhere, ritual scarification has been an ancient practice, similar to tattoos in other cultures, as Hernandez notes. Under the guidance of their elders, different groups make superficial cuts in specific patterns. Ash or pigments may be inserted in the cuts before they heal as scars. For some groups, it has been a form of body art that marks them as a member of their family or community. For some women and men, getting scarred could also be a rite of passage. It might mark life-changing moments like the death of a child or bravery in battle. It represented their ability to not just endure pain, but to demonstrate they had spiritual strength and a willingness to sacrifice for the community. However, the practice of scarification in many cultures has been in decline in recent generations. There’s this scar that [Ms. T] has on her face that nobody can miss it. It starts here and it goes all the way down to here. Like its some kind of sign. I asked Ms. T one day what happened and she just looked at me and said, “I got it playing Double Dutch. “That rope cut your face like that?” “No,” she said. Scars are both symbols and a theme in She a Gem. For the characters with scars, how did they get them? What might they represent? What are reasons people get tattoos, piercings, or dramatic forms of permanent body art? What aspects of their identity are they trying to communicate—to themselves as well as others? Write a short piece about how your friends signal their allegiances through language, clothing, hairstyles, music, or other means? Then, take it a step further: How do leaders of the group indicate their status? A play’s setting is everything that appears on stage—scenery (background), furniture, and props. “It’s often the first thing in a production that the audience sees,” says Deb Sivigny, who designed the set for She a Gem. Sets can be realistic or fanciful, complex or simple—it all depends on the production needs of the play and the creative vision of director. She a Gem takes place on a side street in South Philadelphia. Sivigny wanted to get a feel for the neighborhoods there to help her create the “onstage Philly” where the action happens. Unable to visit in person, she instead went for “Google Walks” down South Philadelphia streets using Google Maps (google.com/maps). 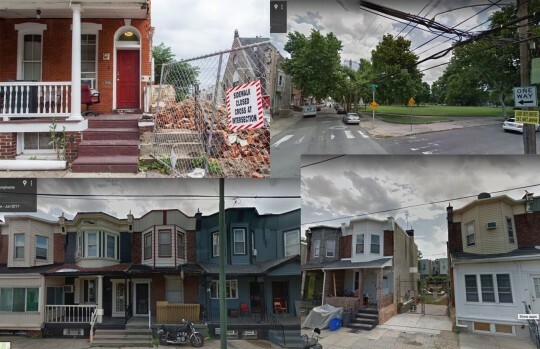 She snapped “photos” of the buildings and row houses, seeking details that would help her bring the community to life. She began sketching, using her imagination to create not just a look but a feel. She then rendered the set in model form so she and the director, Paige Hernandez, could view it in three-dimensions. 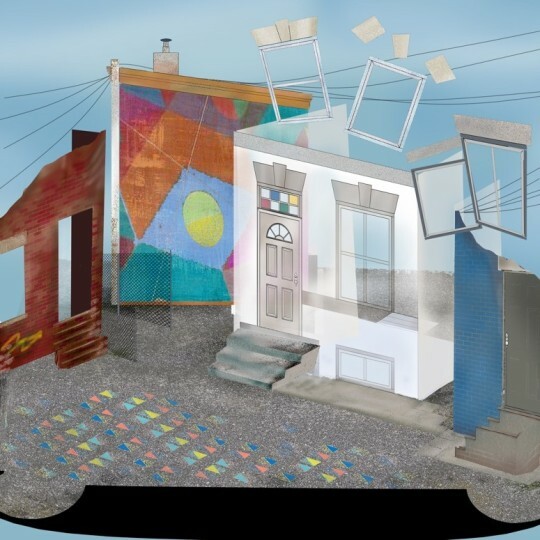 Compare what you see onstage with the following photos, sketch, and model from set designer Deb Sivigny’s development process. Caption: Images from Google Maps. The uses of color in the set, costumes, lighting, and language. The phone lines arcing above the stage, and what they resemble. The three onstage buildings in She a Gem. What does the set and its buildings tell you about the neighborhood and the changes it has seen? Projections on the set and its buildings. Consider what these projections represent and how characters interact with them. The use of music, rhythm, and chants, and what they reveal about the girls and their relationships. The sound of thunder and specific moments when it occurs during the play. When the actors interact with each other and when they speak directly to the audience. How do the characters’ monologues differ from their dialogues? Similarities and differences between the sounds, moves, and ideas of Double Dutch and Hip Hop. At the beginning of the play, Krystin says: “What does Double Dutch mean to me? Freedom. Jumping inside this whirling circle of danger; of hurt; of pain. Getting to dance with all that. I think it’s brave; and ‘if you wanna be brave then you gotta get off them ends and jump!’” What might Krystin be seeking freedom from? What represents freedom to you personally? What does it mean to be brave—not like in action movies, but in real day-to-day life? How are freedom and being brave related? Double Dutch takes serious teamwork. Besides turning and jumping, what are ways the girls demonstrate teamwork in other aspects of their lives? How do you demonstrate teamwork in your life? What conflicts arise among the characters? What causes them, and what are ways the girls deal with them? What are ways different generations connect and communicate during the play? The play speaks to the power we have to make our own families. What does family mean to you? What does it mean to “make our own families” as we grow up? Several gems are mentioned in the play: amber, diamond, ruby, pearl, onyx, jade, opal, jasmine, etc. Do some research on precious and semi-precious stones. Which one (or more) do you feel a special connection with? Why? Name it, explain it, and share your thoughts in writing, or with family and friends. Different views offer different perspectives. Input your home address or the address of your school in the Google Walk feature on Google Maps and take a tour of the streets and neighborhood. Look for things you’ve never noticed before and write them down along with thoughts and feelings. Share them with your family and friends. 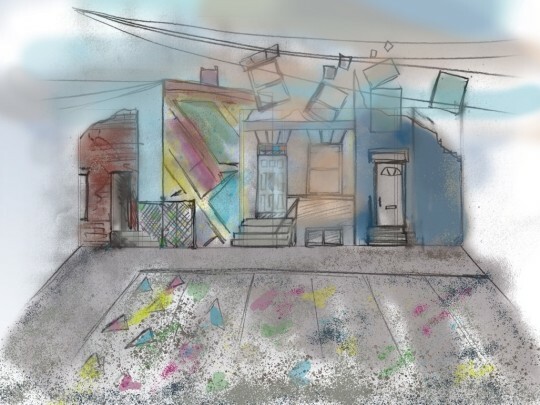 Give your neighborhood the set-design treatment like Deb Sivigny did for a South Philadelphia neighborhood in She a Gem. Imagine you were going to represent your street, community, or school onstage. What buildings, trees, streets signs, or other physical details would you include? Turn loose the artist in you—take photographs and draw sketches or maps. Consider creating a model of your set where your personal story is taking place. Has it been a while since you’ve jumped rope? To get into the swing of She a Gem, find your old rope or unwind a length of clothesline. No need to go all Double Dutch if that’s not your thing. But see what it feels like to jump again—on your own or with friends. One of the beauties of jumping rope? All you need is some space and a little rhythm and your body comes alive. Silly, funny, creative—Double-Dutch chants make their own music. Try them out with your friends! Down, down baby, down down the rollercoaster. Let’s get the rhythm of the hands (clap clap). Let’s get the rhythm of the feet (stomp stomp). Ding-dong, (clap clap) (stomp stomp), hot dog. Hot dog, (stomp stomp), (clap clap), ding-dong! Miss Susie thanked the lady with the alligator purse. GIRL CAN YOU MATCH THIS? OH, YOU SEE HER, TOO? Read the Double Dutch chants above, paying attention to their rhythm, rhyme, and humor. Write your own and try it out with your own rope-jumping or step routine. Professor Kyra Gaunt, PhD, talks about “memories in objects.” For her, holding the ends of the ropes triggers memories of jumping Double Dutch as a girl. She says such objects can be things like favorite toys or jewelry, but also books, songs, sounds, or anything that helps us remember significant moments in life. Interview…an older person about a “memory object” in her or his life. What is it? Where did it come from? What is its story? Write about…a “memory object” in your life. What memories does it bring up? What does it mean to you? What feelings does it trigger? Write…a piece of fiction. Imagine finding an important personal “memory object” 50 years in the future. Describe it and the memories it triggers for you, and how it connects your fictional future with your present. Or considering writing the story from the object’s point of view. Watch competitive Double Dutch and be amazed. Read some truth about the early ties between Double Dutch and Hip Hop. “Double Dutch’s Forgotten Hip-Hop Origins.” By Lauren Schwartzberg. Vice. March 31, 2015. Group homes: “Giving Group Homes a 21st Century Makeover” by Teresa Wiltz. June 14, 2018. The Pew Charitable Trusts. Foster care: “Foster Care”; Child Trends. She a Gem is the story of four African American teens at a pivotal point in figuring out who they are—as girls, as Double-Dutch teammates, and as part of a multi-generational sisterhood. It touches ground where our young people in the audience can perhaps serve as our guides in sharing what the play’s central themes mean to them and their friends; themes that include identity, freedom and courage, family and community. 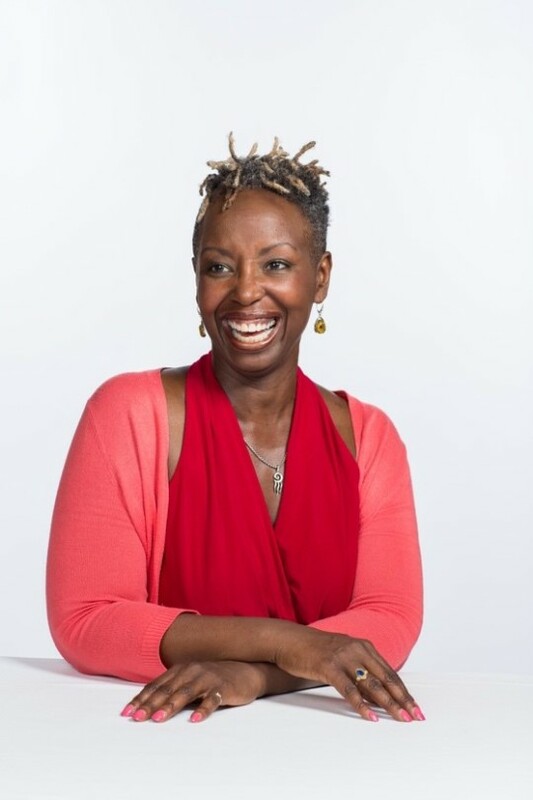 For adults—caregivers and teachers—She a Gem offers unique openings to engage our young people in conversations about relationships, managing conflict, goal-setting, and their place in their communities. The play also dramatizes the relationship between the personal history of the teen girls and the collective memories safeguarded and shared by their elders. We can also observe Ms. T and how she engages the young people in her care with an open heart and ears, offering guidance that is gentle, firm, respectful, and loving. The creators hope this adult guide will support the theater experience and the discussions it inspires. Start a discussion with your young people or students to determine how they want to prepare for going to see She a Gem at the Kennedy Center. The Student Guide can serve as an entry point. Then invite their input: What else do they want to know to prepare for the performance? Do they want to learn more about the social and historical contributions of African American women? Take a tour of the Kennedy Center? Find jump ropes and take a turn on the ends and inside? Consider following their lead on how they want to prepare. You can suggest explorations of theater etiquette (see “Know Before You Go”), stagecraft (see “It’s Not Just a Stage”), and themes in She a Gem. To prepare for the play, ask students to share their own experiences with game songs, jump roping, and other examples of casual play not associated with organized clubs or sports. Have them share stories of simply playing with friends and family. Refer to the Double Dutch chants featured in the Student Guide, reading them aloud or having groups of students prepare them for presentation. (They are meant as an oral art, after all.) Ask your young people to share the game songs, chants, and other examples of word play they know and have performed. Better yet: Grab your phone and document your work with pictures. Access the “Take Action” section in the Student Guide to invite young people to create and write down new chants, in styles that someone could recite as they jump rope or step. Encourage them to write, revise, and share them with you, their friends, or the class. Encourage them to play with rhythm, rhyme, and nonsense words. Introduce the idea of playing and its role in not just childhood but as part of being human. She a Gem focuses on a group of young African American women and how Double Dutch serves as a means for them to connect, bond, express friendship, and process conflict. Before going to the performance, consider discussing with your young people perceived social differences between how girls and young women play as compared to boys and young men. As a group, consider creating a Venn Diagram to show how gender play differs and where it overlaps. (You might also discuss the emotional and social needs different types of play fulfill.) As much as possible, keep the discussion on real experiences and away from abstract or popular generalities. Model and guide mutual respect as much as possible, using questions to probe problematic ideas that may arise. Use and solicit open-ended questions inspired by the “Check This Out…,” and “Think About This…” sections in the Student Guide. These questions are designed to inspire young people to connect the show to their personal experiences. Before attending the show, lead a class preview of the Student Guide sections “Check This Out…,” and “Think About This…” clarifying points as needed. Putting these points in front of students before the show can help them be ready to spot and engage illuminating details in the performance. You might also assign teams of students to choose a point or two from the list to watch for and describe during post-show discussions. Join forces with your young people to determine how they want to process the play afterward. Let them brainstorm ways to get the most out of the experience and keep the conversation going. Do they want to go deeper into the play’s themes? Consider the characters and their motivations in more detail? Talk about acting and stagecraft? Return to the two sections from the Student Guide: “What to Look and Listen for” and “Think About This …” Use them to guide discussions about the production, scenes in the play, the plot, and its characters. Here are three important themes in She a Gem, though you and your young people may note others, as well. Identity relates to how we see ourselves and others, and how we form and express ideas about who we are. Especially for Krystin and Symone in She a Gem, they are at pivotal moments between girlhood and adulthood. They must make choices that reveal who they are and are becoming. Freedom and courage are linked in the play, and explored through the metaphor of Double Dutch. At the very beginning, Krystin talks about the freedom she feels as she pushes through the moment of fear she feels before stepping into the ropes. Near the end, Symone urges Amber to “Stop being scared of the rope…” With the help of Ms. T, each of the girls faces her fears and sees the possibility of greater freedom if she can overcome them. They are discovering they can learn to be brave, especially with the support of their sisterhood, and that may be the path to true freedom. Themes of family and community overlap in the play. Is it relational blood and loyalty that binds people together? Or the unity that comes with shared experiences, belief in one another, and the alchemy of respect and love? The play models how bonds of community and family are formed and tested, and ultimately become infused with faith. Again, create space for young people to explore the production from their own vantage points. To set the tone, consider sharing something from your personal experience that relates to the play and its themes. The intention is to start conversations and keep them going. At the same time, you can use questions to help students spot details they may have missed and dive deeper into the play’s content. Encourage students to back up their interpretations or views with supporting details from the play. Describe the setting onstage, including the set, lighting, props, sound effects, etc. What grabbed your attention, made you smile or tense up? How did that stagecraft influence how you felt as you watched the play? As a group or class, recount what happens in the play. No need to speculate or judge what’s happening, just describe the events as a means to gather detail. Creating a timeline can serve as frameworks for analysis. Describe how Krystin acts when she feels confronted, threatened, or frightened. How do the other girls respond to her when she’s distressed? What about Ms. T’s actions? Forming character profiles can serve as frameworks for analysis of how the characters develop. What makes a thriving neighborhood? What is the responsibility of individuals in a community? What is the community’s responsibility to individuals? Review the activities in the Take Action section of the Student Guide. See which ones might resonate with your young people, such as researching gem stones, writing Double Dutch chants or about “memory objects,” or even getting out some ropes for some real jumping action. Professor Kyra Gaunt, PhD, is an ethnomusicologist at the University at Albany, State University of New York. Ethnomusicology is the study of music as it relates to the social and cultural aspects of the people who make it. She is also the award-winning author of The Games Black Girls Play: Learning the Ropes from Double-Dutch to Hip-Hop. Kennedy Center: What’s your personal history with Double Dutch? Professor Kyra Gaunt: I grew up in the Washington, D.C., area in Rockville, Maryland, and my mother was a Double-Dutcher. She was great at it. I was an only child and an introvert. And honestly, I was not very good at Double Dutch, in part because I thought I was too fat. But the music-making involved in it became something that serendipitously got my attention while in graduate school at the University of Michigan studying ethnomusicology. I was at a reception for an ethnomusicology conference around 1994, and I heard the sound of girls down the hallway. They were twin seven-year-old sisters, black girls, playing a popular hand-clapping game sung in a pentatonic blues scale: “Mary Mack (clap) / Dressed in black (clap) / Diamonds all down her ba - aa – ack (clap).” It was an epiphany to me. I was familiar with this game but not the song. But the beats and rhymes reminded me of rap. It sounded just like Hip-Hop. It was after that that I began to explore and study Black girls’ game-songs, cheers, and the chants and rhymes that accompany Double Dutch. As part of my research, I interviewed 15 African American women and a handful of girls from different parts of the country about their game-songs, and saw that as girls they considered them central to their lives. Also as part of my research, I learned to jump with the Double Dutch Divas in New York City. These were grown women [35 and up] and they let me join the group and taught me how to jump and dance in the ropes to recorded music. It was really a powerful experience—to be doing Double Dutch again, but this time as an adult surrounded by the support of Black women. Each member was given a nickname. One Diva named “Joy” started calling me “Twinkle Toes.” But they ended up calling me “Dr. Diva.” Why? Because I had a PhD. We respect people who have earned a doctoral degree and since I was learning from them so I could write my book about Double Dutch and hip hop, “Dr. Diva” stuck. KC: When and why did Double Dutch take root among girls in African American communities, particularly in urban areas? KG: Street Double Dutch has probably been popular for at least 70 or 80 years, and it was dominant in black neighborhoods like Harlem in the 1950s. It wasn’t all that familiar or popular in the South, though, or in suburban and rural communities. The 1970s was when Double Dutch became bigger than street play and grabbed national attention. Starting in 1973, two New York City police officers, David Walker and "Mike” (born Ulysses) Williams, organized Double Dutch into competitions and tournaments for girls. The Fantastic Four were a ground-breaking group in the late ’70s, and these four teen girls were a very innovative, self-taught team. It’s important to me to say these black girls’ names: Dolores Brown, De’Shone Adams, Nikki Adams, and Robin Oakes. Their picture appears in the Smithsonian’s National Museum of African American History and Culture. They won the American Double Dutch League Championship in 1980, then appeared in two McDonald’s commercials, and the 1981 video documentary, “Pick Up Your Feet: The Double Dutch Show,” which won an Emmy®. All this was going on at the same time Hip Hop was being born in New York City. The Fantastic Four were part of the very first international European rap tour in 1982 with Afrika Bambaataa, Grandmaster Flash, the Rock Steady Crew, and others who all became legends in Hip Hop. But on the tour they were called the Double Dutch Girls, not the Fantastic Four, and they are largely erased from the history of the birth of Hip Hop as it was becoming commercialized from 1979 to 1982. They essentially were made invisible. That has so often been the case—African American girls and women and their contributions get left out of our picture of the past. Still, there is a dynamic relationship between Hip Hop and Double Dutch and the two practices have often sampled from each other. All you have to do is compare the lyrics of Nelly's “Country Grammar” with the popular Double-Dutch chant called “Down, down baby” or “Rollercoaster” and you'll see how girls’ games influenced the music of an emerging Hip Hop artist back in 2000. He went on to win a Grammy® with that song. “Down, down baby” is basically the entire hook. KC: Double Dutch is athletically and creatively intense, but it’s so much more than that. What is its meaning and power, especially for young black women and girls? KG: Over time, Double Dutch became synonymous with “black girl” community and identity in many urban cities. Boys had their usual sports, but as a rule, space wasn’t made for black girls to participate or express themselves, especially their embodied music-making and dance, which was too often viewed as hyper-sexual given the rhetoric about teenage moms or welfare queens in the Reagan era. Double Dutch was one realm where black girls ruled the game and called the shots. They were defining black culture in a public space doing something where Black boys and White girls couldn’t keep up or were not interested in being included. It’s an important reason why Double Dutch has mattered so much for many women of color. It actually created boundaries, carved out a safe space, where black girls could be all they wanted to be devoid of the gender stereotyping and anti-Black sexism elsewhere. Black girls have so often been demeaned and denigrated, or punished for talking too loud or showing attitude, or made fun of because of their “different” names or their hair or their body shape or skin color. Their bodies don’t necessarily conform to the white normative ideals of beauty. But when you’re turning those twirling ropes or stepping inside what looks like an eggbeater that others find impossible to jump through, none of that matters. KC: You sometimes discuss the concept of “kinetic orality” related to Double Dutch. What do you mean by that? KG: Part of being human is the need to pass along our own stories. We usually think of stories in terms of writing or storytelling, but there are also stories in how we move, how we dance, the sounds and songs we make, how we carry ourselves. These are examples of “kinetic orality” – telling stories and learning lessons of style and identity through word of mouth and body. I call the game-songs “oral-kinetic etudes.” Such self as well as social expressions are passed from person to person, generation to generation, place to place, especially within the African American community where so often attempts have been made to erase our history, especially the lived memories and history of black girls. Kinetic orality is an important element in our story, and it is very present in Double Dutch, game songs, and other embodied musical expressions of what we know and who we are. KC: You’ve also talked about “memories in objects.” How do we experience and use such objects in our lives? KG: What I mean by that is that we attach memories to objects and they carry that memory, so to speak, for us. The women I interviewed about their childhood might say, “I don’t remember how the songs to Double Dutch go, it was so long ago.” But as soon as they heard the recording of the twins I first interviewed or when they pick up the handles, they’re right back there. Embodied memory takes you there. If you grew up baking bread, as soon as you put your hands in the dough it connects you to the timeline of your tactile experience. The toys from childhood, they carry memories. An “object” can also be a song or vinyl record cover from the past. These objects trigger social memories—the chants can [do that] when it comes to Double Dutch. Just the feel of your feet scuffling on asphalt can remind you of the playground, a sidewalk, or the tick-tat sound the rope makes as it skips across the pavement. Black girls were musical griots in our neighborhoods and communities across generations. We were the librarians of musical traditions, and the caretakers of those sonic objects that held our collective memories. We helped keep them intact for us and for the world. “How the Jump Rope Got Its Rhythm.” Small Thing Big Idea, a Ted Series. Professor Kyra Gaunt, PhD. Professor Gaunt shares some of the history jump ropes and the unique culture of Double Dutch among African American women. The Games Black Girls Play: Learning the Ropes from Double-Dutch to Hip-Hop by Kyra D. Gaunt, PhD. New York University Press. 2006. “The Power of Theater: What Does Theater Do?” ARTSEDGE. “Hip-Hop: A Culture of Vision and Voice.” ARTSEDGE. Now you're ready for She a Gem. The Human Journey is a collaboration between The Kennedy Center, National Geographic Society, and the National Gallery of Art, which invites audiences to investigate the powerful experiences of migration, exploration, identity, and resilience through the lenses of the performing arts, science, and visual art. Additional support for She a Gem is provided by A. James & Alice B. Clark Foundation; the Kimsey Endowment; The Morris and Gwendolyn Cafritz Foundation; Paul M. Angell Family Foundation; and the U.S. Department of Education.